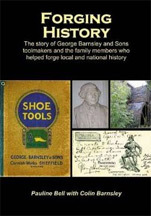 The story of George Barnsley and Sons Toolmakers and the family members who helped forge local and national history. There are a few family names that are known to have deep roots in the Sheffield area. Some have given their names to local streets such as Bamforths and the Creswicks. The Barnsley family is undoubtedly an old Sheffield family name. There was a George Barnsley renting a wheel at Wadsley Bridge as early as 1637 and a George Barnsley was amongst those who were founder members of the Cutlers’ Company of Hallamshire. He was in 1650 to become Master Cutler, a role fulfilled by another George Barnsley in 1883. This George Barnsley was of the second generation of the firm of George barnsley and Sons, toolmakers. Like his father he served on the local council. Descendents were to continue to contribute to the life of the City as well as to that of the country through their service and sacrifuce in the wars that blighted the end of the nineteenth and much of the twentieth century. This book is their story.